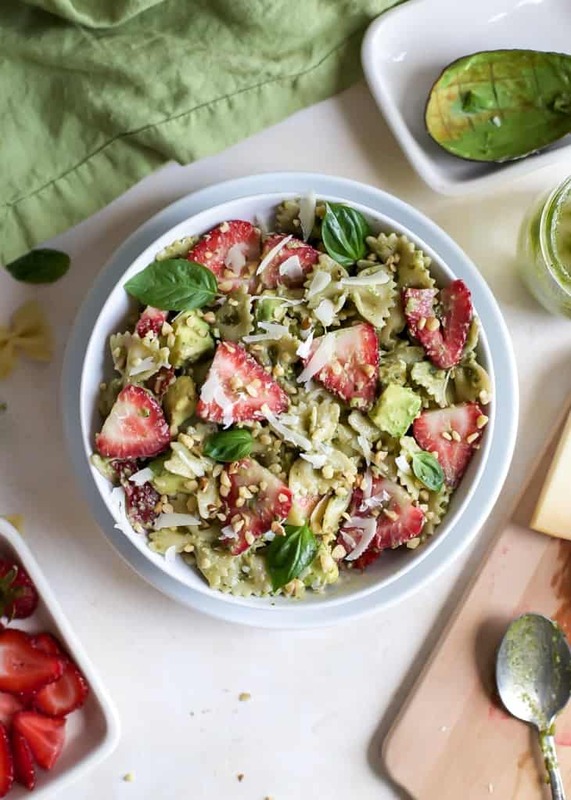 Have you every thought about combining strawberries and avocado with pesto pasta salad? Well, I did and it’s delicious and you’re welcome. Guys, I’ve been having a moment with pesto. I made that macadamia nut basil pesto last week and I wanted to put pesto on all the things. Immediately. As soon as I took a little taste of that heavenly blend or ingredients, I had several pesto recipes running through my brain all at once. Eventually I settled on a pasta salad variety because hello, summer is pasta salad season. Actually, what happened was I threw a bunch of leftover ingredients from the day on a big bowl of greens. Some of those ingredients were strawberries and avocado with the basil pesto. And then I thought “Okay, can I do a pesto pasta with strawberries?! Is that weird?” Yes, I actually had that conversation with myself. Well, clearly I didn’t think it was that weird because obviously that’s what we have here today. This recipe is so simple and seriously a lovely combo of flavors! 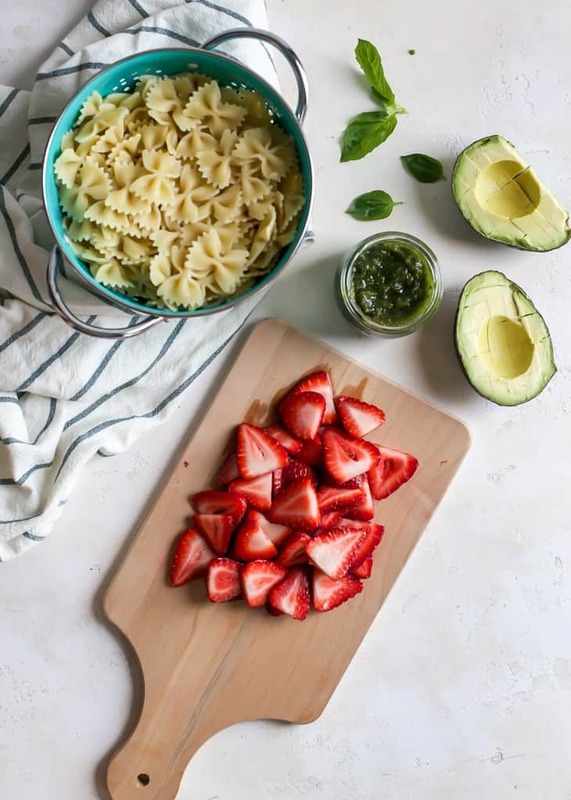 You may not think pesto and strawberries go together but just trust me – they do! If you like basil + strawberry combo, you’ll love this wrap too. Plus pasta salad is the best for spring and summer gatherings. Who doesn’t like pasta salad?! And with with all of the pasta varieties out there, you can easily cater to those with any dietary restrictions. 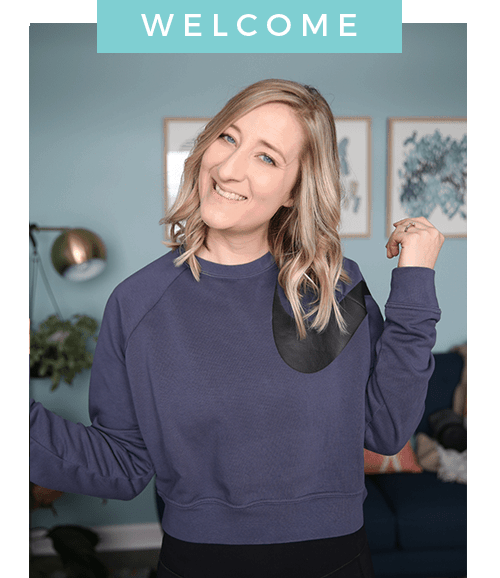 Oh, and did I mention this recipe is easy? I think I did. But for real, pasta salad is so easy and just takes a little tiny bit of prep work. 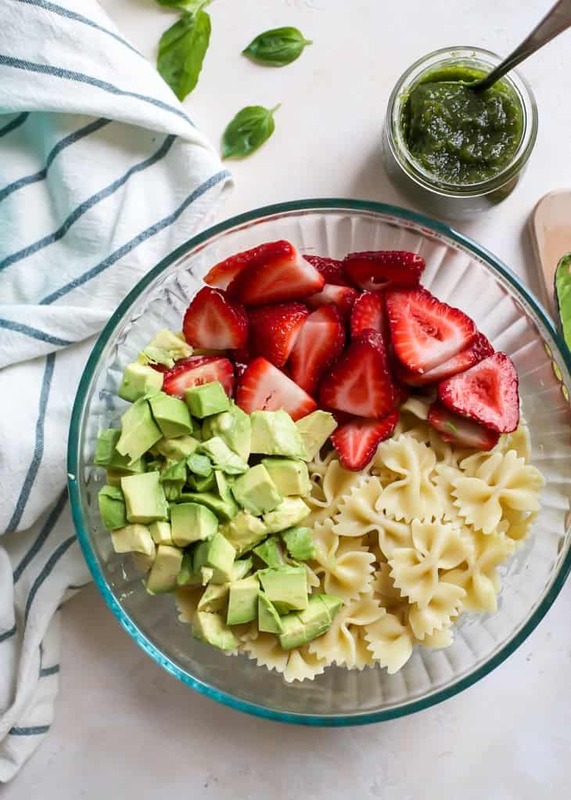 You can slice up the strawberries and avocado as the water comes to a boil, and make the pesto while the pasta is boiling. And then all that is left is combining the ingredients! 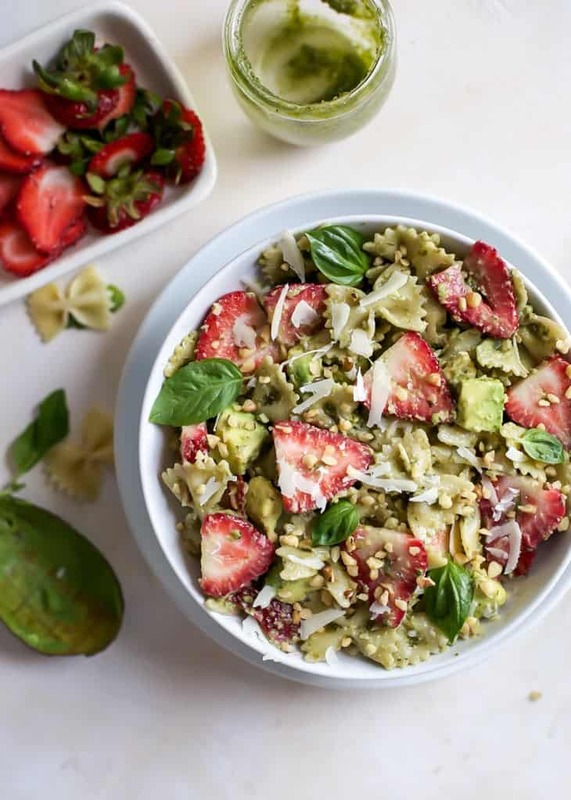 This Strawberry Avocado Pesto Pasta Salad is so fresh and satisfying! Perfect for those summer BBQs, work lunches, and you could even toss in some grilled chicken if you’re looking for a meat option. 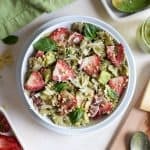 This Strawberry Avocado Pesto Pasta Salad is simple and quick, vegetarian and gluten-free friendly using your favorite pasta. 3 cups dry bowtie pasta (weighed 8.5oz), option to use whole grain, gluten-free, chickpea, etc. Cook pasta according to package instructions, cooking al dente. Drain and rinse pasta under cold water. 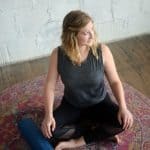 Option to use gluten-free pasta such as chickpea or quinoa pasta. I really like Banza. 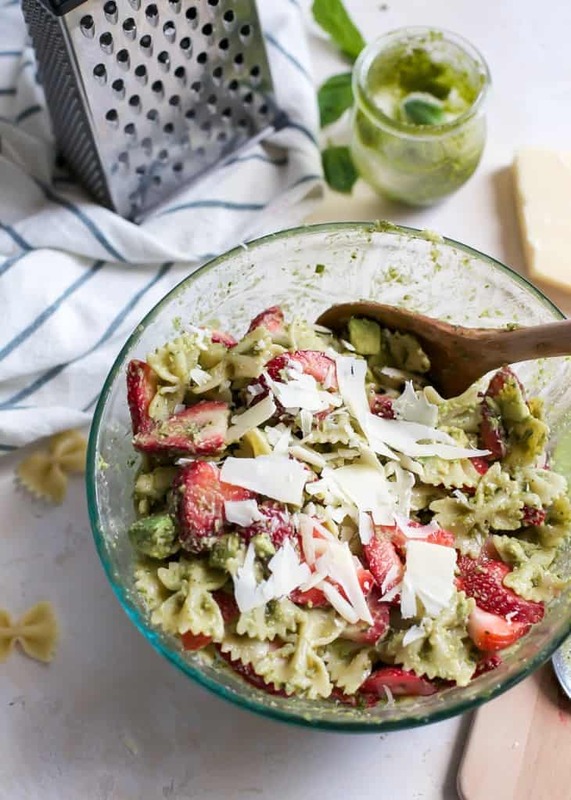 In large bowl combine cooked pasta, pesto, strawberries, avocado and parmesan cheese. Gently toss until pasta is coated. Sprinkle with crushed walnuts and top with more parmesan for serving, if desired. Note: I found this pasta salad to be best enjoyed within 1-2 days. I am not sure I’d recommend prepping this a day in advance for a party. You could prep each step and then combine right before serving. If worried about avocado browning, add in just before serving. This looks so bright and fresh, perfect for summer! 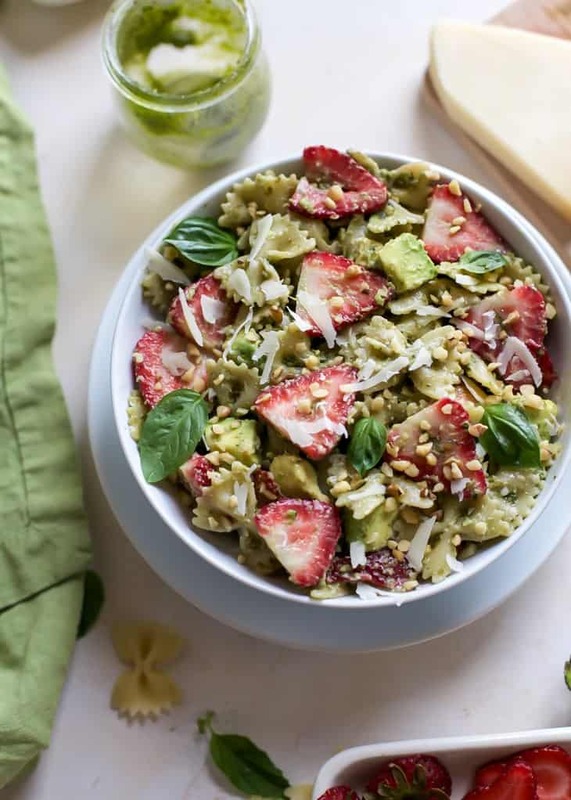 I love to pair avocados with strawberries but I have yet to add pesto! Great idea. I will try this out!